This corded necklace is made using Satinique cording for a beautiful piece with some beautiful shimmer. It measures 17 inches with a center jeweled piece that adds 2 more inches. 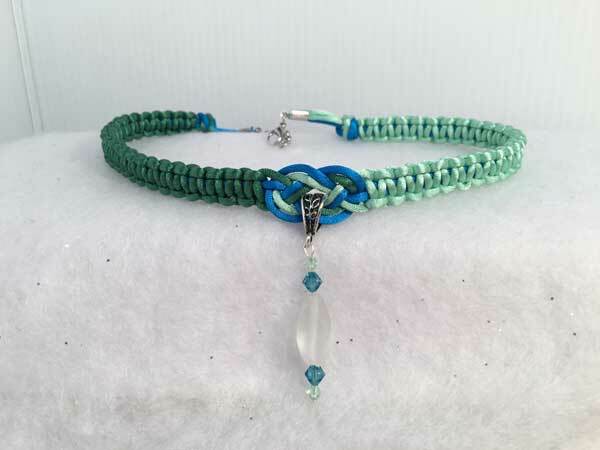 It is done in mint green, turquoise blue and dark sage. The jeweled piece is a large, twisted oval, frosted rock quartz, surrounded by blue and mint-green bicone crystals. Normally, I would not have gone with the frosted quartz, but my daughter suggested it and...I kinda like it!